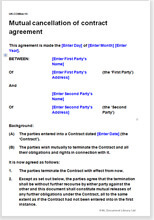 This is a simple agreement, written in plain English, to cancel legal contract. It provides certainty that neither side remains bound. This is a short, self-explanatory agreement. It confirms that both parties wish for another contract to continue no longer. It can be used with any other type of contract, from a residential tenancy agreement to a loan to a service contract.